Roland's Boutique SE-02 is a lot of synth for $500, but at $399 it's an absolute steal. Read on to find out how you can get it for this knockdown price. 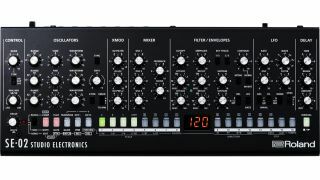 The only analogue instrument in Roland's Boutique line-up, the SE-02 was created in collaboration with Studio Electronics, which is responsible for - among many other things - the Tonestar and Boomstar instruments. It features three VCOs, a voltage-controlled 24dB low-pass filter, and a dual gain-stage amplifier. Considering there’s also a nicely-featured sequencer onboard, the SE-02 is a very impressive piece of kit for the retail price, but Sweetwater and various other retailers are currently offering it for $399. Recommended for anyone who wants a great-sounding, portable and versatile monosynth for the studio and stage.